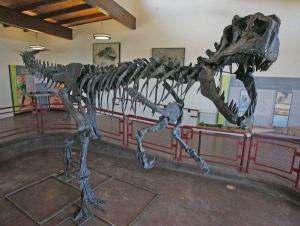 The Cleveland-Lloyd Dinosaur Quarry, one of Utah's best known excavation sites, will re-open for the season on March 27. The quarry offers interactive displays and exhibits, including a display on the excavation history of the site, a fossil preparation table, replica skulls of animals found there, and a mounted Allosaurus skeleton. Visitors can also watch paleontologists excavating fossils inside its covered building. The quarry is open Fridays, Saturdays, and Sundays, weather permitting. Hours are 10 a.m. to 5 p.m. on Fridays and Saturdays; noon to 5 p.m. on Sundays. Entrance fee is $5 per adult ; children 15 and under are free. Educational groups should contact Michael Leschin at 435-636-3619 to schedule tours. The quarry is approximately 30 miles south of Price.